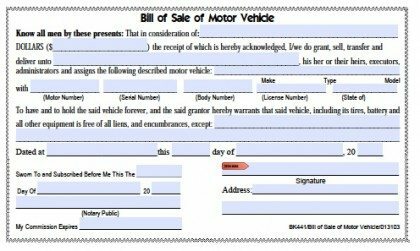 The Hamilton County, Tennessee bill of sale, also known as Form BK441, is a legal document that allows a resident to be able to convey the ownership to another party for any type of motor vehicle. Odometer Disclosure Statement – For any vehicle under 16,000 pounds and below 10 years of age. Power of Attorney – If the owner of a vehicle decides to sell using another person to handle the negotiation and the transfer of title. Description of Motor Vehicle including: Make, Type, Model, Motor Number/Serial Number, Body Number (if any) License Number, and State of Registration.